My youngest daughter, Jenessa, is an artist. She loved art so much, she became an elementary school art teacher. She lives and breathes … art. Ever since she was a little girl, she would sit down in the middle of the floor, her crayons, scissors, glitter and glue sprawled out beside her, and would begin the adventurous task of creating some new work of art. Do you ever feel that way about life? I know I have so often. 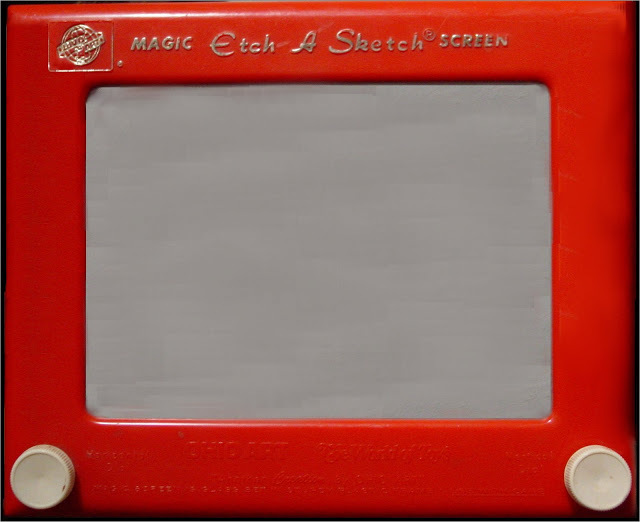 It seems to me a bit like this … Our very being is the Etch-a-Sketch of our lives. We draw and create our hopes and dreams, the very desires of our hearts, all the way from the inner-workings and core of who we are, sketching them into our minds, only to have the world and circumstances come along and shake things up. We are left with a blank screen. Everything seems lost. Everything looks erased. This past week I experienced deep troubles that shook up the very soul of my being. I had spent hours and hours diligently reading scripture, praying and fasting, while seeking what I should do next. And just as surely as I thought the plans were changed, I remembered something. The God of the Universe, the very God who sent His Son for us, is the Ultimate Creator….the Artist of our lives. He is the One who turns those knobs on the board of our lives, and designs the picture on our screen. He is the One, who has created who we are, and knows the inner workings of every place and inner corner of our hearts and souls. If that same God is the Artist, why would I not relax into allowing Him to redo that picture? Perhaps it will just look even sharper, clearer, and crisper to me now. The world and circumstances may shake us to the core, until we can’t see straight, can’t see the road, can’t see the picture, but God is the Artist of who we are, and He will come in and re-create. We must remain in faith. Kathy I sure need it!!!!! I get so off track, a lot!!! Your news letter refreshs me all the time. They r saved on my comp. to go back to, ALOT!!!!!! !